The term "Crowdfunding" may be new to many, however it's an alternative way of raising money to fund a particular project (in this case, a fashion design). 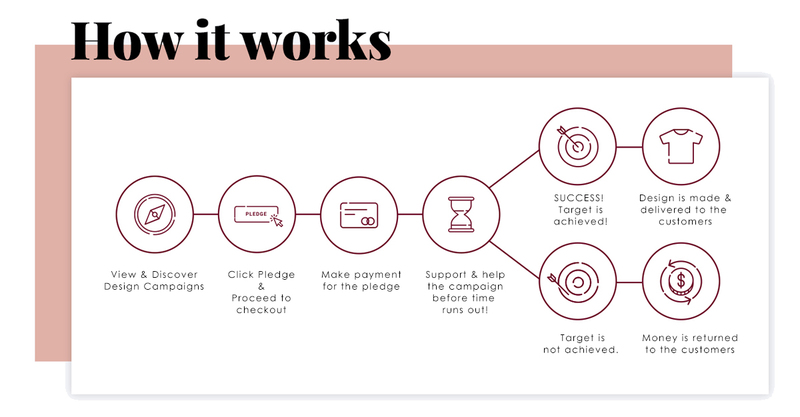 As for the customers, crowdfunding is a process where you offer to support a project by paying first, and receiving the reward item (a custom piece of the garment that you've pledged for) after it gets made. It is somewhat similar to the process of "Pre-Buying", however with a twist - the design is only made when the campaign hits a target! Come on board and view and discover various design campaigns that's been submitted by aspiring fashion designers all over the world. To learn more on how to be a Designer, Click Here. See something you love & can't bare the thought of you not owning one? Pledge and support the design! What you see is what you get, and you can now decide what's fashionable. By pledging for the design, you would be placing an order for a piece garment to be made specifically for you. Make payment for the pledge order that you've just made through a selection of Payment methods provided. Your payments through SenangPay is protected. This would mean that the collected funds is only utilised for production prior to the successful closing of a campaign. When a campaign fails, the money will be immediately refunded back to the customers. As customers and supporters, you'll have nothing to lose. It's time to support and help local fashion designers bring their designs to life! Once the pledge payment has been successfully made. Don't just wait around! Instead, support it and share the campaign with all your family and friends! Every campaign has a countdown of days left to pledge. Every pledge counts as it would determine the outcome of the campaign. The help and support that you'll be giving these designers would not only be appreciated - but it'll make their dreams come true. And it is to see their designs get successfully pledged and MADE! This is when then waiting stops! Time has run out and its time to see the outcome of the design campaign. Outcome 1: If the campaign has successfully hit the minimum pledge orders of 30 people/pieces - THE CAMPAIGN IS SUCCESSFUL! Outcome 2: Unfortunately, if the campaign did not manage to achieve the minimum pledge order, then the campaign has ended and will not go through the next phase. Outcome 1: The designs will then be manufactured by Royale Demure, undergo a strict quality check & the new limited edition apparel is posted to the pledgers! Subsequently, the designers will get royalties for each piece sold! Outcome 2: The campaign has failed. Pledgers will get FULL REFUND into their bank account. We are truly grateful for the support and the love shown to the designs and the designers!